It's back to the drawing board for the connections of Telescope after he could finish only second to David Livingston in the Betfred Rose Of Lancaster Stakes at Haydock. The winter favourite for the Derby, Sir Michael Stoute's colt had to miss the Classic but appeared to be back on the right road after an easy success in a rapid time at Leicester. However, despite Ryan Moore being the last off the bridle in the Group Three, he was outbattled in the straight by Mike De Kock's charge, who was previously trained by Aidan O'Brien. David Livingston had shown in his previous outings at Royal Ascot and at Sandown that he was somewhere near his classy two-year-old form and put together with Johnny Murtagh, they pulled a length clear, with Frankel's brother Noble Mission in third adding substance to the form. 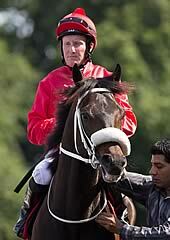 Murtagh said: "He was very progressive as a two-year-old and Mike seems to have sorted him out now. When I got after him, he really didn't want to lose and he's won well in the end." De Kock's assistant trainer Steve Jell said: "He's really maturing now. Last year I don't think the ground helped him and he was quite immature. Johnny thinks he could step up in trip again. He's entered for a race in Turkey, but we won't throw him in at the deep end. That will have been great for his confidence." Connections of Telescope felt their colt had not shown his best on the day. 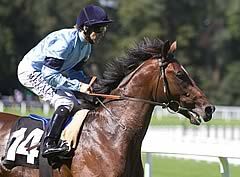 Harry Herbert, racing manager for owners Highclere Thoroughbred Racing, said: "Ryan said he felt a bit lethargic today. There was no gear change, he just stayed on. He lacked the zip that he shows us in a morning. "When you look at this horse, you can see that he's still changing and is not the finished article. He hasn't run a bad race, but when you come here with his reputation, it was always going to be difficult if he got beat. "We'll possibly see about stepping him up in trip, but we will just let the dust settle. He could have just had an off day. We will regroup, but with this horse we are always thinking of next year."